With a wide range of colour combinations and tape widths up to 36mm near borderless printing and high speed/high resolution print capabilities the PT-P900W is ideal for facilities management document archiving asset labelling and creating on-demand labels whenever and wherever required. This compact desktop label printer can be connected to your PC or Mac using a USB cable or connected to your wireless network to share between multiple users or be placed in a more convenient location away from your computer. The advanced cutter can produce one long strip of labels that can be easily peeled one-at-a-time and ensures labels are kept in the correct order. The PT-P900W uses P-touch Editor label design software for Windows and Mac. It boasts advanced features normally found in expensive desktop applications such as industry standard 1D and 2D barcodes import of logos and other graphics and allows you to use the fonts installed on your computer. Link to a Microsoft Excel� spreadsheet or .csv file to print multiple labels quickly and efficiently. Instantly create and print simple labels from your smartphone or tablet without needing to fire up your PC. 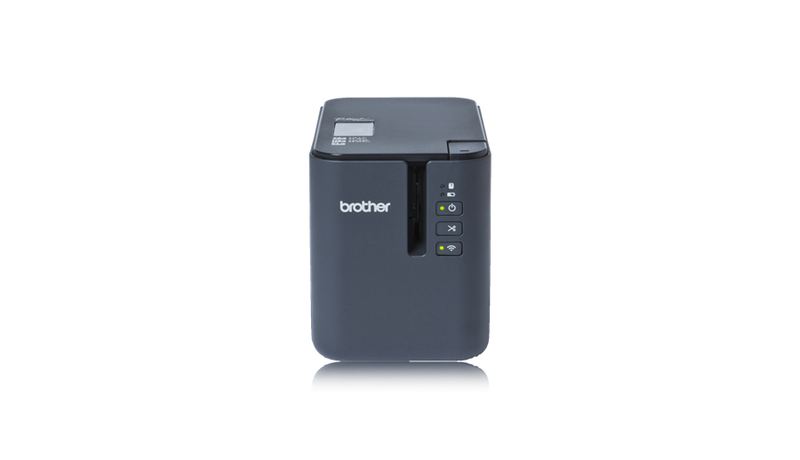 The Brother iPrint&Label app wirelessly connects to the PT-P900W to let you design and print labels from your iOS or Android device. Or if you need to identify electrical and data cabling and equipment use the specialised Brother Cable Label Tool app to print labels for wrapping around cables or for sticking to faceplates electrical distribution boards and other specialist equipment. Software and app developers can use various software development kits for Microsoft Windows iOS and Android devices to enable label printing from within your own software and apps. This makes the PT-P900W ideal to integrate into various solutions where durable labels are required. There are situations where AC power may not be available such as on construction sites or if the label printer needs to be used on a portable trolley. The PT-P900W has an optional battery base and rechargeable lithium-ion battery pack to enable label printing wherever and whenever required. Brother TZe tape cassettes come in a wide variety of widths and colours and include specialist tapes such as strong adhesive flexible ID (for wrapping around cables or creating flag labels) tamper evident and security tapes. These laminated tapes are incredibly durable and are designed and tested to withstand extremes in temperature sunlight moisture abrasion and chemicals.